VET Student Loans is a Government scheme that assists eligible students to enrol in approved higher-level vocational education and training (VET) courses to pay their tuition fees. The debt must be paid back at the relevant repayment rate when your income is above to compulsory repayment threshold. displaying competence at Exit Level 3 in the approved Language, Literacy and Numeracy test. has been in Australia for period totalling 18 months during the previous 2 years. In order for a student to continue to access VET Student Loans, students may require during their course of study to communicate their agreement that the Secretary continue to use VET Student Loans to pay tuition fees for the course. Students will need to confirm your active and legitimately continued to be enrolment in a course by logging into the Department of Education and Training’s electronic Commonwealth Assistance Form (eCAF). Failure to do so may affect your ability to continue accessing VET Student Loans. 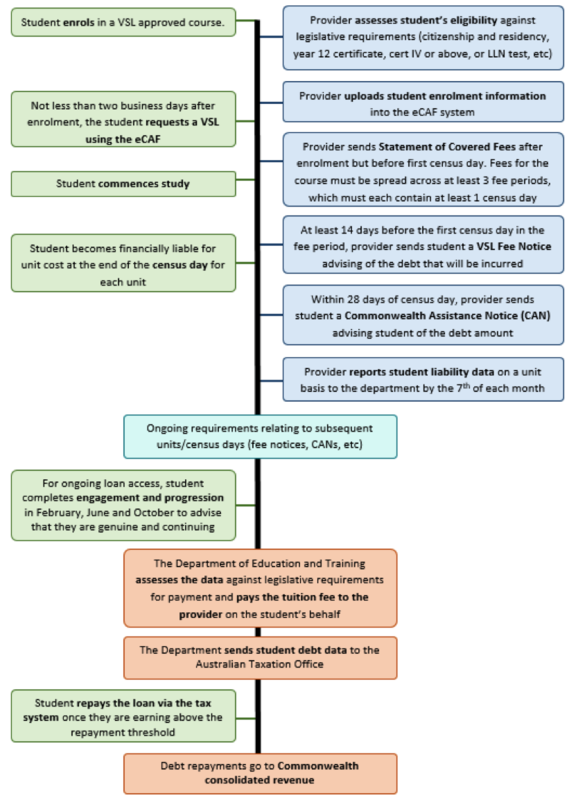 Eligible students will be entitled to access loans up to a capped VET Student Loan Limit (detailed below). Course providers may charge above this cap for a course, and if so, students will be expected to pay for the difference according to the provider’s billing period. The amount loaned cannot be greater than the student’s remaining FEE-HELP Balance. The amount of HELP debt a student accrues if you receive the maximum amount of the VET Student Loan for the course could be up to 120% of the loaned amount. How can I pay tuition fees not covered by VET Student Loans? If you are not eligible for VET Student Loans or you need to or choose to pay part of your tuition fees directly the other payment options available to you are outlined in Course Payment Options. Tuition fees will be reasonably apportioned across a specific number of sequential fee periods. Each fee period will contain at least one census date. A census date is a date by which enrolment may be cancelled without incurring tuition fees for the course or a part of the course. A student may cancel their enrolment in their course or part of the course as per the Student Withdrawal, Refund and Re-Credit of FEE-HELP Balance Policy (VSL Eligible Students). If a student withdraws before the census date for a course or part of a course, the student will not incur a VET Student Loan debt for the course or part of the course and will receive a refund for any additional tuition fees already paid for the course or part of the course. Step three – Enrol with us! 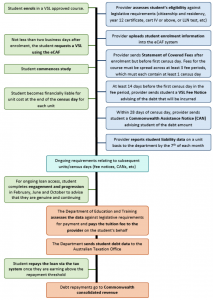 Step five – If eligible, and deemed academically suited to study your chosen course you will be asked to complete the required information in the electronic Commonwealth Assistance Form (eCAF) to request use of A VET Student Loan to pay. IMPORTANT: You must submit your eCAF application to the Commonwealth before your first census day. For more information about VET Student Loans, click here.